I’ll admit it: I’m proud of my alma mater, Brown University. There. I’ve said it. Since its founding in 1764, Brown has produced a long list of achievers: political leaders, inventors, authors, artists, scientists and more. (I know…some of you are saying, “How could they have gone so wrong with Parsons?” But that’s a story for another time) One alumna in particular, Janet Yellen, is about to make history. Today, the news broke that Janet Yellen will be named as the next Chairman of the nation’s central bank—and the first woman to hold that post. This is welcome news for several reasons, not the least of which is that Dr. Yellen has been a consistent voice of reason with respect to the Fed’s monetary policies. Additionally, Larry Summers famously stated in a 2005 speech that (and I paraphrase) women statistically have mathematical ability inferior to men’s. However one might parse or spin his statements in that speech, it was generally interpreted as being dismissive of women. There is a certain poetic justice to Janet Yellen’s appointment to the post. As Chairman, Yellen is generally seen as a “dove.” This means that she will in all likelihood continue Ben Bernanke’s accommodative monetary policies. This is unquestionably good news for the mortgage markets, since it is the Federal Reserve’s monthly purchase of mortgage-backed securities that is holding rates at their present attractive levels. Yellen is well respected in the Senate, and should enjoy a relatively easy confirmation. 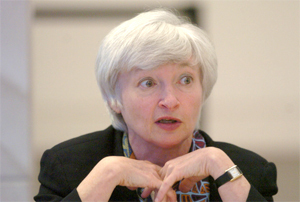 I am very happy that President Obama took my advice and selected Janet Yellen for this important post. And Mr. President? Please feel free to consult me on any other appointments you may be considering. I’ll always take your call.